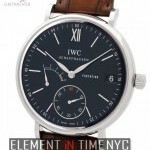 Case material: Steel; Charge: Automatic; Conditions: Never worn Presentation condition : Without documents; Place: Usa, New York Model: Portofino $ 4270 Element iN Time Reference: IW3565-02 This Watch Is Powered By A 25 Jewel IWC Caliber 35110 Self-Winding Movement With A Power Reserve Of 42 Hours. The Watch Is Completely Un-Worn And Comes With The Original Box, Paperwork, And Hangtags. 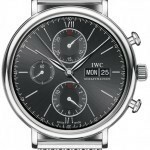 The Case Is Stainless Steel With A High Polish Finish. The Steel Crown Is Stainless Steel As Well. The Case Back Is Steel With A Brush Finish. The Crystal Is Scratch-Resistant Sapphire. 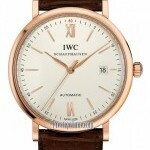 The Dial Is Black With White Index Hour Markers, And Roman Markers For The Twelve And Six-O'Clock Positions. The Stainless Steel Hands And Markers Are Luminescent-Filled, With The Exception Of The Seconds Hand. A Date Aperture Sits At The 3-O'Clock Position. Mounted To The Watch Is A Black Alligator Leather Strap, Closed By A Stainless Steel Tang Buckle. 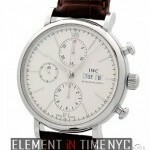 A Warranty And Certificate Of Authenticity Will Be Issued By Element iN Time NYC. Case material: Steel; Charge: Manual; Conditions: Never worn Presentation condition : Without documents; Place: Usa, New York Model: Portofino $ 8085 Element iN Time Reference: IW5101-02 This Watch Is New Un-Worn With Original Box And Papers. 45mm Stainless Steel Case With A Transparent Case Back. 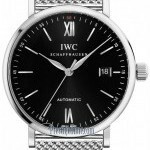 Black Dial With Index & Roman Numeral Hour Markers. IWC Brown Alligator Skin Strap By Santoni, A Famous Italian Leather-Goods Manufacturer, With An IWC Stainless Steel Tang Buckle. Water Resistant To 30 Meters (99 Feet). 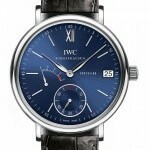 IWC Caliber 59210 With 30 Jewels, 28,800vph And Approximately 8 Days Of Power Reserve. 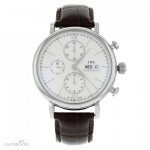 Date Window Is Located At The 3 O'Clock Position, Small Seconds Sub-Dial Is Displayed At The 6 O'Clock Position And The Power Reserve Indicator Is Positioned At The 9 O'Clock Position. Case material: Steel; Charge: Automatic; Conditions: Never worn Presentation condition : Without documents; Place: Usa, New York Model: Portofino $ 5165 Element iN Time Reference: IW3910-07 This Watch Is New Un-Worn With Original Box And Papers. Polish Finished Stainless Steel Case With A Solid Case Back. Stainless Steel Crown And Push-Buttons For The Chronograph. Water Resistant To 30 Meters (100 Feet). Silver Dial With Polished Steel Applied Index Hour Markers. Featured On The Dial Is A Day-Date Window (3 O'Clock), A Small Seconds Sub-Dial (9 O'Clock), A 30-Minute Counter For The Chronograph (12 O'Clock) As Well As A 12-Hour Counter For The Chronograph (6 O'Clock). 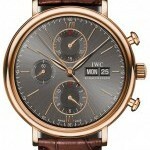 IWC Brown Alligator Skin Strap With Brown Stitching. 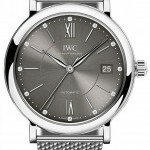 Attached To The Strap Is An IWC Stainless Steel Tang Buckle. 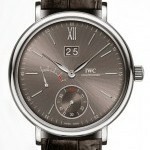 IWC Caliber 75320 Self-Winding Movement With An Approximate Power Reserve Of 44 Hours When Fully Wound. 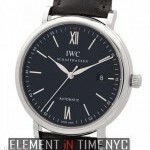 A Full Two Year Warranty And Certificate Of Authenticity Will Be Issued By Element iN Time NYC.